When I first started at Campaign Monitor, I reached out to a number of our blog subscribers and asked them what they liked about the blog and what they’d like to see more of in the future. The conversations I had were invaluable in defining our content strategy. They allowed us to ensure we were covering subjects people wanted to read about and that the topics were relevant to active readers. Getting qualitative feedback from your customers or audience like that is incredibly important, and email is a fantastic way to do it. Read on to discover how to create a great customer feedback email that will prompt connections with readers and deliver insights you can use to grow your business. Earlier this year, Groove noticed that their ‘churn rate’ (percentage of customers that cancel their account per month) was on the rise. Unhappy with this, Alex (Groove’s CEO) set out to find out how he could improve his product, so people stuck around longer. He sent an email to his entire customer base asking for 15 minutes of their time to have a chat about their experience using the product. Within hours, he had hundreds of responses from customers offering advice about how the product could be improved and how he could get more people to stick around. He learned that many people were leaving because they thought Groove didn’t have a particular feature they needed. In reality, however, the product did have that capability, and he was able to implement better customer training and education to let people know of these hidden features. He also found that a lot of people were using the product in ways he hadn’t ever imagined, and it opened entirely new markets that they have begun actively pursuing. Can you imagine how valuable feedback like this would be to your business and what it would enable you to do, in terms of increasing revenue and growth? You can get this kind of insight by simply sending the right email to your customers, and the following 5 tips will help you send a great feedback email that gets you insightful information on your business. Keeping feedback emails simple and focused is key to getting more of that valuable feedback you crave. The team over at Marketing Experiments have a mantra that says, “clarity trumps persuasion,” and they have the results to back it up. In a recent experiment, they increased the number of conversions by 200% merely by removing the extra elements and distracting offers from the page and focusing it on one simple conversion action. As you can see, there are no unnecessary images or headings in this email, just our message and a call-to-action button. The no-nonsense format provoked a response from actively engaged readers. The simplicity helps focus the recipient’s attention on the message and the main conversion action we want them to take, which encourages more of them to click the button and take the survey. When creating your feedback email, stick to a simple, focused design to reduce distractions and encourage users to take your desired conversion action. If you need help implementing this, the Inverted Pyramid model is a great framework to help guide you. According to the social psychology phenomenon known as the Bystander effect, the probability of someone helping you is inversely related to the number of bystanders. The more people who are involved in a specific situation (like receiving a feedback email), the less likely any of them are to react. Instead, they assume someone else will offer the help the person is looking for and move on to something else. To overcome this, use personalization tags to address each individual recipient directly. A touch of personalization will help make them feel the email was sent directly to them and you are interested specifically in their feedback, increasing the chances you’ll get a response. Furthermore, if you have other information about the user (such as their company name), try to include that in your email as well. Using first name personalization in email campaigns is pretty common these days but, whenever possible, you should include the recipient’s company name or some other details about them. Then you take the personalization to a level they are not familiar with, and will increase your chances of getting responses by making them feel like the email was sent exclusively to them. In Robert Cialdini’s book Influence, he discusses a Harvard study in which a person tries to cut in front of a line of people waiting to use a copier. In the first instance, the person pushing in simply asked, “Can I use the copier?” and 63% let him cut in line and go first. In the second instance, the person asked, “Can I use the copier because I need to make copies?” and 94% let him go first. Despite the person’s reasoning being nonsensical (everybody was in the line because they needed to make copies), there was a significant increase in the number of people who let him go first purely because he explained his reasons. So, when asking for customer feedback in an email, tell your users why it’s important to you and what you plan to do with it. Not only does this give them the “why” behind the survey, but it gives them an incentive to complete it (having their say in what features get added to a product they use). Ultimately, by helping people to understand why you want this feedback and what you plan to do with it, you give people more reason to provide you with their feedback and increase the number of responses and insights you receive. There are many ways to collect feedback from a customer. You can implement customer feedback questions where customers reply to your email with their thoughts, take a survey, or jump on a call to talk further. Whichever method you choose to receive your feedback, make sure to include a very clear call to action in the email so that the person knows precisely what the next step is. Looking at the feedback request example email from before, we chose to have recipients complete a GetFeedback survey that asked them some questions about their email marketing habits. Because this is the way we wanted to collect feedback, you’ll notice we included a very clear call-to-action button in the email linking through to the survey. In our tests, we found that including a call-to-action button increases conversion by 28%, so, by having one in this email, we made the next step very clear and got more people to click-through to the survey and give us their feedback. Once you’ve sent the email, there are still several steps a user has to take before you receive the valuable feedback from the survey. If you don’t make these steps really easy for the user to complete, they are going to drop off, and you’ll get fewer responses and fewer insights. By Survey – According to our recent data, 41% of email opens happen on a mobile device. If nearly half of all recipients are opening your email on a mobile device, then it’s important to make sure your survey works on mobile devices as well. If it doesn’t, it won’t matter how great your email campaign is, as people will simply drop off before completing the survey. Tools like GetFeedback make it really easy to create beautiful, mobile-friendly surveys that will help ensure you get more responses and insights. By phone – If you want to set up phone calls with willing recipients, you’ll need to put a good system in place for scheduling the calls. Otherwise, your inbox will be crammed full of back-and-forth emails with recipients trying to coordinate availability across time zones. Tools like ScheduleOnce make this easier. You simply connect your calendar to ScheduleOnce, and it will show people your availability in their timezone. They can then select a time that works for them, and it’s automatically added to both your calendars. By reply email – Getting people to respond to your email with their feedback is one of the best ways to receive responses, but storing, analyzing and sharing the feedback can be difficult. Fortunately, our friends at Zapier have a handy solution for this. Their email parser can receive the reply emails and convert them into rows in a Google Spreadsheet where you can easily analyze and share the information. You simply enter the unique address the parser gives you in the “Reply to” field, and any responses from your campaign will magically appear as rows in your chosen Google Spreadsheet. Offering incentives in customer feedback emails is a huge encouragement for customer participation. Feedback email response rates increase by 30% when incentives are included. Customers appreciate being rewarded for spending their time. By offering incentives, customers feel like an important component in your business model, which will not only keep them purchasing from your business, but will help advance your business from a customer perspective. You can offer all types of incentives in your emails. If you want to offer something to customers without spending a lot of money, plan on sending virtual incentives. Quick thoughts, for example, is an app that offers free iTunes gift cards after customers take their survey. We’re not saying you need to develop an app, but free virtual gift cards are one incentive option you can offer customers after they send in their survey. A chance to win a bigger product—car, lottery, snowmobile, etc. Before you’ve received the results from your customer feedback emails, think about your current business model. What do employees think could be changed to make it better? Then, once you’ve received all your feedback, lay it out and start including it into your pre-existing business strategy. Remember, your results will depend on what your customer feedback questions are and how you can put them into place. For example, if one question was asking about customers’ opinions on if they had a positive customer service experience and the majority answered no. Restructure your customer service strategy. Hire some more people, change the way employees interact with customers, etc. Getting feedback from your customers about your product/services is an incredibly simple and easy way to get insights that can grow your business. It can give you information about where your business is falling short of meeting your customer’s needs, and it can open your business up to entirely new markets and revenue possibilities. Regardless of why you need feedback, there is no better forum to start the conversation than email, and these 5 tips will help you create a great campaign that ensures you get the insights you are looking for from any customer feedback request. So go ahead and start using email to reach out to your customer base for feedback. We think you’ll be pleasantly surprised at the insights and information you’ll find. 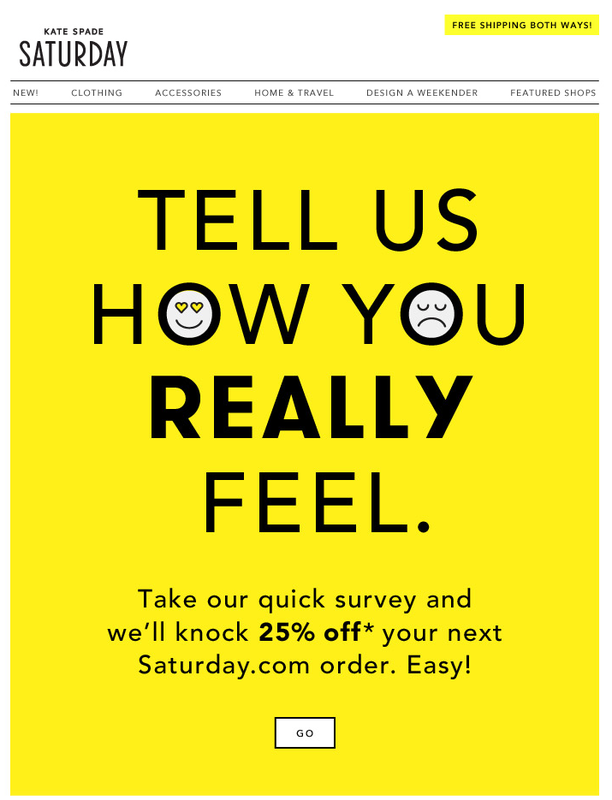 Your turn: Have you used emails like this to get feedback from your customers? What were some insights about your business that you were able to learn? Share your stories with us in the comments below.